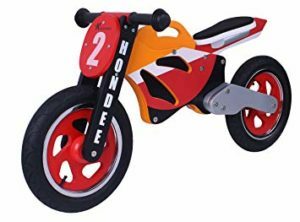 A motorbike balance bike is something completely different from traditional balance bikes, as while a normal balance bike will resemble a pedal bike – a motorbike balance bike will offer an exciting motorbike style along with racing designs so they are perfect for young motorsport enthusiasts! 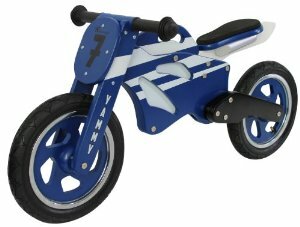 The Yammy Wooden Motorbike balance bike is made by Kidzmotion, who also offer the Jiggy Wooden Balance bike and the Oowee Pink Balance Bike. This bike will really catch the eye with a blue and white colour scheme including the frame, tyres and handlebars. It comes with a birch plywood frame, a soft padded seat and a saddle that is adjustable to 3 different heights between 38cm and 42cm. Check out our guide to balance bike seat heights here. Just watch out for the handlebars as you are not able to adjust the height of these! An extra feature that we really love are the stickers which are available as a 2, 3, 4 or 5 so they can be personalised with your child’s age. This bike will probably be a bit too big for an average 2 year old with a 38cm saddle height, and it is also quite heavy. However, it will suit older children who are getting into racing perfectly and it is great value at £54.99. It is also available with a stand for an extra £5 at £59.99. Another bike to consider is the Molto Premium Motorbike. 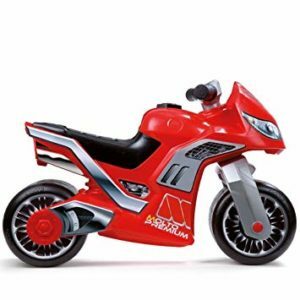 Young riders will love this bike which has all terrain wheels and a bright red, motorcycle design. 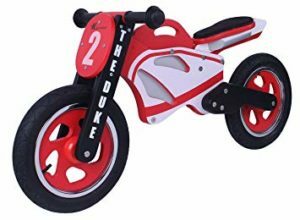 The Molto Premium Motorbike has a saddle height of 32cm, so it would be suitable for 2 or 3 year olds (although make sure you check their inseam first). 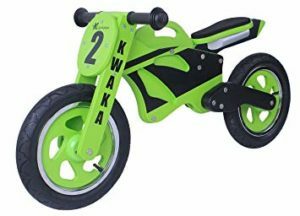 The sturdy build and wider wheels also make it much easier to initially balance and propel than a traditional balance bike. This bike doesn’t require any assembly so it is ready straight out of the box and is available for around £40. Another option from Molto is the Molto “Cross Superman” Motorcycle. As the name suggests, this motorbike balance bike has a fantastic Superman design so it is ideal for children that love superheroes!